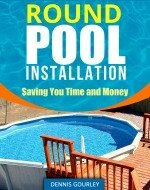 In this section of above ground pool questions I discuss topics like how to make your pool child safe, overlap or beaded liners, above ground pool water levelers and more. For a complete list of questions about above ground swimming pools visit the questions index page. 23. What do you do with your pool in the winter? Sometimes I let mine go to heck in a hand basket, but that's not what I'd recommend. In the Phoenix Arizona area where it does not freeze in the winter vinyl pools do not require much maintenance at all. If you run the filter one or two days a week and keep chemicals in it you will be fine. As soon as the weather starts to warm be sure to increase the filter to daily. A winter cover is a great help during the winter months. In areas where the pool freezes over it is good to drain the water to below the skimmer and then follow the winterizing instructions for the filter system. 24. How long should I run my filter? The biggest mistake new pool owners make is not running the filter enough.12 hrs. a day is good for the beginning and end of summer but the hotter it gets the more you should run the filter, up to 14 -15 hrs. a day. If you have any problems with your pool water being cloudy or green or anything else, run your filter constantly (24 hours a day) until the water is clear. Taking a water sample into the nearest pool store could help at this point, but I usually find that a bag or two of vinyl shock treatment will take care of most any problem. 25. I love my above ground swimming pool but I am constantly having to get out of the pool to get a cold beer or settle for drinking warm ones, do you have any suggestions? I used to have the same exact problem, click here to see what I did about it. 26. Are my small children safe around our above ground swimming pool? 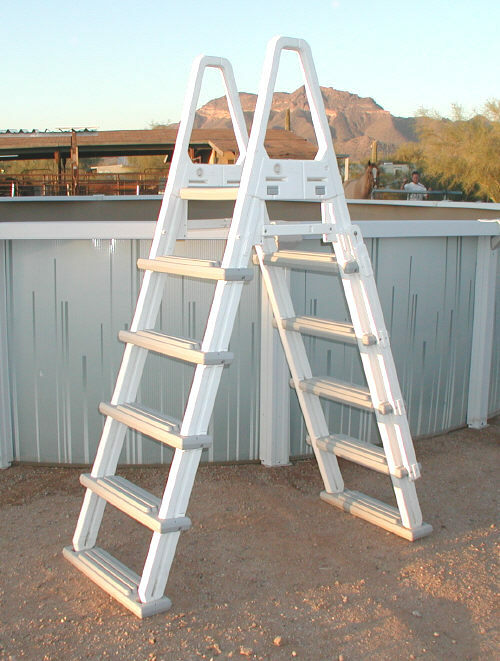 For many years the pool safety ladder was about the only means of child proofing the above ground pool. The outside steps of the ladder either raise up in the air or they come completely off. When you consider that the child drowning numbers increase every year as do the numbers of new ways there are to prevent them I would strongly suggest something besides just your safety ladder. Safety fencing is one of the best ways. Rot iron pool fencing is very popular. Portable safety fence is a less expensive option with the same look as rot iron. Fencing that attaches to the pool itself is great also. This can attach to the pool or the pool decking. The pool alarms are great, anyone with small children should consider one. Solar lights for the pool and the yard or deck are nice safety devices also. Winter covers that attach with a cable and winch are excellent for keeping kids out. 27. I am constantly forgetting to turn my hose off and overfilling the pool, what could I do? Overfilling an above ground pool is not a good idea. The water coming out of the skimmer or spilling over the sides could erode the ground around the pool resulting in the the pool cove washing out and possible liner damage. I have seen this happen many times. 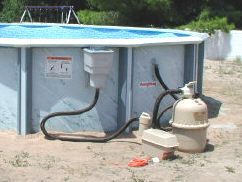 This is the only automatic water leveler I have seen that would work well for above ground pools. A much less expensive method, and of course my favorite, is the little timer device that attaches to your water tap and you set the timer for one hour or so and walk away knowing your pool won't overfill. 28. How do I know if I have an overlap liner or a beaded liner? Overlap liners are the most common. 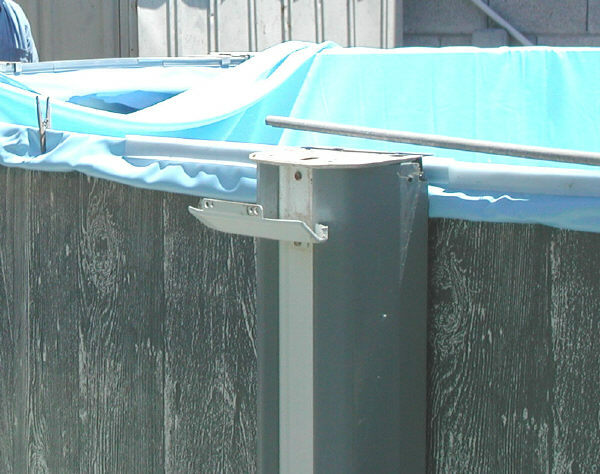 They fold over the top of the pool wall and are held in place by coping and metal rods. If you look under your top rail from the outside of the pool and see liner hanging over, you have an overlap liner. A beaded liner fits into a groove on the inside of the pool wall. There will be no liner showing on the outside. You would then need to look under the rail on the inside of the pool and see if you have a bead receiver. A beaded liner will fit into a receiver hanging down an inch or so from the top of the wall. A j-hook liner will attach directly to the top of the pool wall. Ask the Pool Pro any question you may have about above ground pools.